Southern Splendor is another grand way of traversing across the colorful and culturally vibrant southern regions of India. Extensively traveling through the length and breadth of Kerala and Tamil Nadu, this luxury train offers 8-day sojourn to its guests. A property of Golden Chariot, a luxury train in India that has so far introduced the various cities of Karnataka to a thousand guests in a never before way, Southern Splendour promises to be no less spectacular and fascinating. Come board this enchanting sojourn and relive the glory of India, yet another time. The journey starts from Bangalore, the justified capital of Karnataka. The city has modernized with its ethnicity well preserved. The architectural brilliance of British has embellished the city with charm. Your day starts at Taj West End where you will be given brief presentation about the Golden Chariot and your journey, followed by cultural dance. And after the enchanting cultural performances you will leave for darshan in ISKCON (International Society for Krishna Consciousness) after which you will head towards the Golden Chariot. As you enter Yeshwanthpur railway station, the Golden Chariot team will warmly welcome you aboard. 1500 Arrive Taj West End to proceed for the check-in formalities at the hotel followed by the Hi-Tea at Banquet Hall at 1600 Hrs. 1600 Soothing stroll in the beautiful heritage gardens of the Taj. 1730 Proceed for the presentation on do’s and dont’s for The Golden Chariot tour followed by a visit to Chitrakala Parishad / Art gallery. Conclude the tour with a cultural show. 1845 Krishna Darshan in ISKCON Temple (The International Society for Krishna Consciousness). 2015 Arrive at Yeshwantpur railway station to a traditional Aarti and Tikka with floral garlands. 2245 Departure time for The Golden Chariot train for Chennai, dinner will be served on board. Meal summary Dinner is included and will be served in our restaurant car. On your second day of the trip, after the breakfast aboard in Chennai, you will leave for Mamallapuram. Here Krishna’s Butter Ball (A naturally formed rock along the hill-side, breaking the law of physics), Arjuna’s Penance with beautiful carvings, Ganesha Temple, Caves and Five Rathas temple will be visited. After the break and having lunch, you will go for sightseeing and darshan in Shore Shiva Temple and straight from here you will reach Pondicherry station where the Golden Chariot awaits you for the dinner and over-night stay. 0730 Arrival at Chennai central railway station. 0800 Breakfast will be served on board, followed by a visit to San Thome Basilica and Museum. 1000 Leave by road for Mamallapuram. 1115 Sight-seeing in Krishna’s Butter Ball, Arjuna’s Penance, Ganesha Temple, Caves, Five Rathas Temple. 1330 Lunch will be served in a luxury resort in Mahabalipuram. 1500 Sightseeing in Shore Shiva Temple and back to resort for tea and refreshments. 1700 Drive to Pondicherry railway station to board the Golden Chariot. 2000 Dinner and overnight on board The Golden Chariot. On the third day you will visit Puducherry; where the culture of French and South India merge to create something adorable. The day Starts from the Auroville Ashram with the iconic Matra Mandri; it is a huge complex with lush greenery, workshops and what not! You will need rest after this affair and then follows the visit to Ganesha temple and Aurobindo Ashram. 0800 Breakfast on board Golden Chariot. 1000 Leave for sightseeing in Auroville Ashram where you can have darshan at Matra Mandri. 1330 Lunch will be served at a luxury 5 star resort in Pondicherry. 1545 A visit to the Aurobindo ashram in the French town, Ganesha temple, shopping and stroll on the pristine Promenade beach. 1830 Back to the Golden Chariot. Freshen up and enjoy the amenities of your ride. 2330 Train departs to Tanjavur. On day 4, the train arrives at Tanjavur railway station, from where the passengers leave for Brihadeshwara Temple (World Heritage Site) and shopping in the emporium. Soon you will leave for Sri Rangam Temple in Trichy. The Chariot will be waiting for you to board it, in Trichy station. 1000 Darshan at Brihadeshwara Temple (a UNESCO World Heritage Site) and shopping in the emporium. 1130 Visit to the Chola Bronze Museum. 1300 Enjoy delicious lunch at Ideal River View Resort. 1500 Drive to Trichy by road. 1600 Visit Sri Rangam temple in Trichy. It is India’s largest temple complex dedicated to Lord Vishnu. 1830 Return to Trichy railway station to board The Golden Chariot and refresh. 2000 Dinner on board The Golden Chariot. 0015 Departure time for The Golden Chariot train for Madurai. This would be the fifth day of the journey when you will visit Madurai; one of the oldest settlement of the country. There is a whole new contrast of old world charm and modernization in Madurai. Starting with the breakfast on board, you will leave for Meenakshi Sundareswarar Temple, 1000 pillars and museum. And for the lunch and relaxation, you will hop back to the Chariot and then leave for Gandhi museum. In the evening the enchanting light and sound show at Thirumalai Nayak Palace will be savored. After the dinner will be served at night in the Golden Chariot, the train will leave for Kanyakumari. 0515 The Golden Chariot arrives in the Madurai Railway station. 1000 Darshan at the Madurai Meenakshi Sundareswarar Temple. 1130 Visit 1000 pillars temple and museum. 1300 Lunch on board Golden Chariot. 1530 Free time for shopping or rest on board The Golden Chariot. 1800 Visit the Thirumalai Nayakar palace for sound & light show. 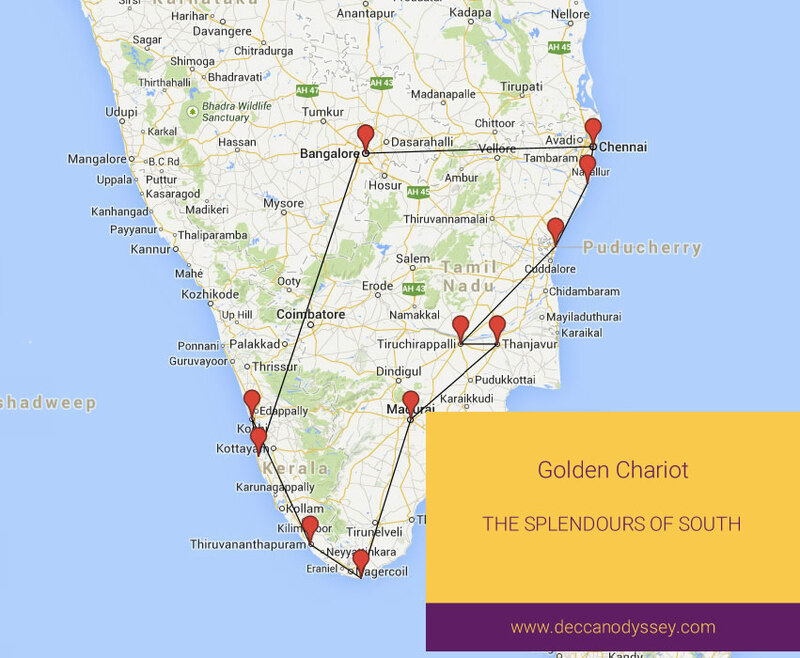 2315 The luxury Golden Chariot departs to Nagercoil(Kanyakumari). Reaching the southernmost point of India, Kanyakumari, early risers can sit back and enjoy the tranquil sunrise view. After the breakfast is being served you will visit Padmanabhapuram palace, former kingdom of Travancore. Just when you will hop back to the chariot and have lunch, the train will leave for Kochuveli station, from where passengers will leave for Vivanta by Taj. In Vevanta, tea and refreshments will be served, followed by cultural dance performance. Coming back aboard, the train will leave for Kochi. 0345 Golden Chariot arrives at Nagercoil station. 0515 Drive to Kanyakumari to enjoy sunrise Kanyakumari, at the tip of peninsular India, offers a panorama of the confluence of the Bay of Bengal, the Arabian Sea and the Indian Ocean. Early risers can enjoy the ever-adored sunrise view. 0730 Transfer to Golden Chariot and breakfast on board. 0930 Visit the famous Padmanabha Palace also known as Wooden Palace. Once the official residence of the erstwhile Travancore dynasty Padmanabhapuram palace complex is regarded as Asia’s largest wooden palace the palace has fourteen structures spread over an area of six acres. The palace is also noted for its rich mural collection tracing back to the 17th and 18th century. The earliest of structures here is believed to have been constructed in 1335. Pointed gables, dormer windows and long corridors are specimens to the tradition architecture of Kerala. 1300 Back to the Golden chariot as the lunch gets served. 1600 The Train reaches Kochuveli station. 1630 Drive to Kovalam. Enjoy the sunset, leisurely stroll. Tea and refreshments will be served in the beach. 1930 Cultural performance followed by dinner at a 5 star luxury resort, Kovalam. 2200 Back to the Golden Chariot and soon the train leaves for Kochi. Today in the morning after breakfast passengers will leave for Vembanad backwaters in the beautiful house boats, cruising in Punnamada Lake. In the resort they will eat lunch and continue with their journey towards Kochi area. In the evening they will leave for Ernakulum railway station where the train awaits for departure to Bangalore. 0830 Arrive Alleppey and de-board the train Golden Chariot. 0900 Depart for Houseboat cruise on the Vembanad backwaters. 1230 Arrive at backwaters luxury resort for Lunch. 1330 Depart to Kochi by road. 1545 Visit the Chinese Fishing nets and a walk around the Jew town for shopping. 1830 Return to Ernakulum railway station to board The Golden Chariot. 1930 Departure time for The Golden Chariot train. This will be the last day of the journey. Passengers will be given farewell by the Golden Chariot team after lunch. Hence the journey comes to an end. 0800 Breakfast will be served. 1000 The train reaches Bangalore and passengers will receive a warm farewell by the Golden Chariot team. The Oberoi Bangalore, a 5-star property on the prestigious Mahatma Gandhi Road. Pampering spa treatments, an outdoor pool and a gym are provided. Personal butlers and room service are available 24 hours. Complimentary WiFi is available in all rooms. Luxurious and elegant, all the air-conditioned guestrooms enjoy beautiful garden views. A flat-screen TV, minibar and personal safe are included. En suite bathrooms come with hot-water showers and Ayurvedic toiletries. The Oberoi Bangalore is within 2 km from M.G. Road, Brigade Road and Commercial Street. It is a 30-minute drive from Cantonment Railway Station and a 1-hour, 30-minute drive from Bangalore Airport. The well-equipped business centre and helpful concierge desk are open 24 hours. Le Jardin offers daily buffet meals, Rin Naam serves authentic Thai food, while Chinese cuisine can be enjoyed at Szechwan Court. Brewed coffee and tea, as well as cocktails, are available at Polo Club.